Perhaps the most poignant description of drug desensitizaton todate is Oliver Sacks' moving work titled "Awakenings". Oliver Sacks, a neurologist, wrote about his attempt to awaken his patients suffering from "encephalitis lethargica" with the drug L-dopa. As he describes it, "Many of these patients "awakened" and did spectaculary well for a while, but the effects of L-dopa then faded, and the patients returned to their trance-like states." Many asthmatics use Albuterol inhalers. During an acute asthma attack, the asthmatic often repeatedly uses the inhaler. There comes a point at which the Albuterol loses its effect in spite of increasing the dosage. These two examples show desensitization to drugs, which occurs much more often than many people realize. One of the perils of drug development is the occurrence of desensitization, which is also called tolerance, fade, tachyphylaxis or down-regulation. Desensitization is a very general phenomenon that is characterized by a reduced responsiveness following prolonged exposure to a hormone or drug. Most drugs bind to an area on the cell membrane labeled as a receptor to produce a response. Occupancy of a wide variety of hormone and neurotransmitter receptors by agonists often leads to desensitization, that is, to a loss of receptor responsiveness to subsequent stimulation by the same drug. Receptor activation and desensitization are intimately related processes that must both be considered when developing a useful drug. For example, the highly potent opioid drug etorphine is not a medically useful drug because it can only be used a few times before the body becomes desensitized to it . In many other cases of clinically relevant drugs, such as the b-adrenoreceptor drugs used for heart failure or asthma treatments, desensitization is also a well-recognized problem [2-4]. Enhanced Pharmaceuticals owns a technology that prevents desensitization to these drugs by combining a drug with another complementary drug in a mathematically-calculated optimal ratio. The complementary drug binds to the same receptor as the initial drug and, when given together with the initial drug, makes the receptors in the body maintain the ideal response for the initial drug. Tests of our technology in vitro and in vivo have proven it to be highly effective. This has enormous potential in the treatment of many serious diseases and clinical conditions. Our original biophysical model was derived from pharmacodynamic theory, which studies how drugs interact with their specific target receptors [5-7]. Surprisingly, the model suggested that it would be possible to prevent, diminish or control drug-receptor desensitization by combining an agonist with an antagonist drug. This could create new designer drugs that buffer the drug-receptor response in ways that have been previously overlooked and would offer a new technology for enhancing the safety and efficacy of many pharmaceuticals [5-7]. Figure 1. This graphic shows how our technology optimizes the therapeutic effect of a drug. 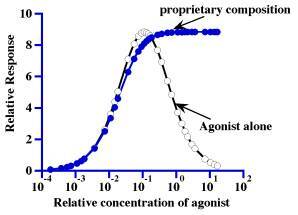 The graph represents the response of tissue to application of an agonist (alone) and an agonist combined with an antagonist (proprietary composition). As seen by the agonist alone response curve, the response rises to a maximum and then decreases due to desensitization. In contrast, the proprietary composition curve reaches a maximum and maintains that level, i.e. desensitization does not develop. Figure 1 was derived from our model and should be compared with the other figures of experimental work given below. For a more in-depth discussion of our methodology, please refer to our methods patent U.S. #5,597,699 and the recent paper (Lanzara R, Optimal Agonist/Antagonist Combinations Maintain Receptor Response by Preventing Rapid b1-adrenergic Receptor Desensitization. Intl. J. Pharmacol. 1(2): 122-131, 2005) . The biophysical model was tested experimentally for three different combinations in two separate systems. Initially the model was tested experimentally with Guinea pig trachea, which is a widely used substitute for in vivo pharmacological studies of human trachea. This study tested the ability of a previously calculated combination of isoproterenol and propranolol to prevent receptor desensitization produced by prior exposure of the trachea to isoproterenol. The agreement of the experimental data with the theoretical value was within 1.25%. This excellent result validated the method for calculating the specific agonist/antagonist combination to prevent desensitization in the Guinea pig trachea for the beta-2-receptor system . The findings that b-adrenergic agonists given with b-adrenergic antagonists reduces b-adrenergic receptor desensitization were validated by independent work modeling asthma in the laboratory of Dr. Richard Bond from the Department of Pharmacological and Pharmaceutical Sciences, University of Houston . These initial successes led to subsequent experiments to further confirm our model. The next two experimental tests of the model determined the responses of positive inotropic agents, dobutamine and isoproterenol (Isuprel), to affect the force of muscular contraction in the heart with and without our agonist/antagonist combination. These drugs were selected for their specific actions on the beta-1-receptor system in the heart. This was done in rats in vivo to further validate the model and determine its usefulness for potentially enhancing these drugs for clinical use. These experimental proof-of-concept studies demonstrate that our technology works with a sustained response, and in some cases, also protects the heart from arrhythmias as a secondary benefit (see Figure 2 below). Figure 2. This graph shows the in vivo data from our first animal studies. It compared the responses of isoproterenol alone to the isoproterenol/metoprolol combination (agonist/antagonist Iso/Met). This graph compared to Figure 1 above shows that our technology worked as predicted. In a separate experiment comparing the side-by-side responses of our Iso/Met combination to Iso alone, we found that each individual animal had an improved response with the agonist/antagonist combination (see Figure 3). Figure 3. These two graphs show another in vivo study from our proof-of-concept animal studies demonstrating an improved contraction of the heart. 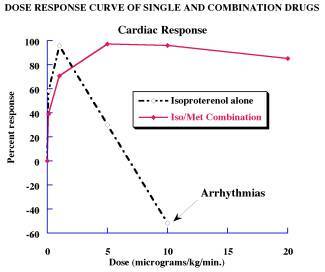 The study compared the responses of isoproterenol alone (left graph) to our Iso/Met combination (right graph) in the same animals. This showed that our technology works to prevent desensitization for each individual animal tested. The agonist/antagonist combination (Iso/Met) shows a much reduced variability over the entire dosage range with a sustained maximal response, which may make these drugs safer and easier to use clinically. In a further experimental proof-of-concept study, we found similar promising results predicted by our original model. Figure 4 shows that the cardiac response to dobutamine alone (Dob, open squares) was enhanced by our dobutamine with metoprolol combination (Dob/Met, solid circles). These results show that it may be possible to administer a drug that will increase a patient's cardiac response and avoid receptor desensitization [6,7]. Figure 4: This graph demonstrates that our technology works for enhancing the therapeutic effects of dobutamine. The open squares are the dobutamine alone and the solid circles are our combination of dobutamine with metoprolol. Other academic labs and potential competitors have tried to address the problem of desensitization [1-4,8-13]. This demonstrates that the scientific community recognizes the importance that receptor desensitization plays for a wide range of clinical situations, which has consequences for drug discovery and development in the future. Presently, the most recognized clinical area where desensitization occurs is for pain relief. Experimental work with opioid receptor drugs by Drs. Shen and Crain has demonstrated that administration of low doses of an opioid antagonist, such as naloxone or naltrexone, together with an opioid agonist strengthens the agonist signal . Although the mechanism for this effect is not mentioned or discussed in most of the scientific literature, the effects of antagonists used in combination with agonists have been previously recognized and independently reported for several other receptor systems [11-13]. Yet no researchers have optimized a specific ratio of agonist with antagonist that is essentially active over the entire dose-response range or developed a method to predict the receptor response with these agonist/antagonist combinations. There are examples of independent research supporting the use of agonists with antagonists to reduce desensitization sprinkled throughout the scientific literature. Fernandes, et al. reported that the b-adrenoreceptor desensitization in guinea pig trachea was almost completely abolished by incubation with relatively low concentrations of the non-selective b-antagonist, propranolol, or with the b2-selective antagonist, ICI-118551 . In 1991, Geoffrey, et al. found that competitive antagonists of a glutamate receptor decreased the desensitization of this receptor . Similarly Fu, et al. concluded that an antagonist, progesterone (antagonist), reverses the tachyphylaxis (desensitization) to oxytocin (agonist) of human myometrium tissue . Our biophysical model suggests a new paradigm and a general mechanism for the initial receptor response and desensitization. Some scientific studies have characterized receptor desensitization as primarily due to the phosphorylation of receptors by specific receptor kinases (enzymes that add phosphate groups to other proteins in the cell). However, there are also scientific studies that argue against this as a primary mechanism for all receptors and suggest that alternative explanations are needed [2,5-8,11-12,14-16]. The fact that some receptors desensitize rapidly (milliseconds to microseconds) argues against phosphorylation being the only way receptors desensitize [12,14,15]. Receptor phosphorylation may be a secondary action resulting from other molecular processes that take place first within the cellular receptors themselves. Also, receptor phosphorylation has been observed to account for only part of the total receptor down-regulation observed after agonist exposure . In addition, the reduction in desensitization observed when antagonists are combined with agonists suggests that alternative mechanisms are necessary to explain rapid receptor desensitization [2,5-8,11-12]. Our technology uses specific combinations of different drugs to reduce or eliminate desensitization. This works because combining each drug together buffers the receptor so that the response is more controlled than with either drug alone. Historically, drug design has focused on optimizing a drug's ability to produce a response (signal) and its potency. Desensitization was seen as an unavoidable side effect. For example, if a drug has a lower affinity for its receptor then it must be given at higher doses, possibly leading to toxic side effects . Drug designers have circumvented many toxicity issues by developing drugs that bind tightly to the receptor, thereby permitting extremely low effective dosages. Although this approach resulted in less toxicity, it may have also inadvertently selected for drugs that cause maximal desensitization . Similarly, by reducing the efficacy of a drug, one also reduces the maximal ability of the drug to signal its target receptor . Our experimental results indicate that desensitization may be prevented for many different therapeutic applications. Decoupling desensitization from activation opens the intriguing possibility of designing drugs that primarily act by activating the receptor without concomitant desensitization. This suggests an exciting new direction in pharmacology in which drug-induced signaling and desensitization may be controlled independently by changing drug agonist/antagonist combinations to create designer drugs. Many current drugs may be reformulated into new, more useful combination drugs, which would create future opportunities for safer and more effective drugs. Yu, Y., L. Zhang, X. Yin, H. Sun, G. R. Uhl, and J. B. Wang. m-Opioid receptor phosphorylation, desensitization, and ligand efficacy. J. Biol. Chem. 272:28869-28874, 1997 link. Callaerts-Vegh Z, Evans KLJ, Dudekula N, Cuba D, Knoll BJ, Callaerts P, Giles H, Shardonofsky FR, Bond RA. Effects of acute and chronic administration of badrenoceptor ligands on airway function in a murine model of asthma. Proc. Nat. Acad. Sci. 101: 4948-4953, 2004 link. Finney, PA et al. Albuterol-induced downregulation of Gsa accounts for pulmonary b2-adrenoceptor desensitization in vivo J. Clin. Invest. 106:125-135, 2000 link. Penn, R. B., R. A. Panettieri, Jr., and J. L. Benovic. Mechanisms of acute desensitization of the b2AR-adenylyl cyclase pathway in human airway smooth muscle. Am. J. Respir. Cell Mol. Biol. 19:338-348, 1998 link. Lanzara R., Compositions to enhance the safety and efficacy of bio-pharmaceutical drugs. USP 6,593,094; 2003 link. Lanzara R., Drug compositions to prevent desensitization of cellular receptors. USP 6,673,558; 2004 link. Lanzara R., Optimal Agonist/Antagonist Combinations Maintain Receptor Response by Preventing Rapid Beta-1-adrenergic Receptor Desensitization. Intl. J. Pharmacol. 1(2): 122-131, 2005 link. Shen, K. F., and S. M. Crain. Ultra-low doses of naltrexone or etorphine increase morphine's antinociceptive potency and attenuate tolerance/dependence in mice. Brain Res. 757:176-190, 1997 link. Woolf, P. J. and J. J. Linderman. Untangling Ligand Induced Activation and Desensitization of G-Protein-Coupled Receptors. Biophysical Journal 84:3-13, 2003 link. Lefkowitz , et al. Method of detecting inhibitors of agonist-specific desensitization. United States Patent 6,605,424; 2003 link. Fernandes, L.B., et al. b-Adrenoceptor desensitization in guinea-pig isolated trachea. European Journal of Pharmacology, 157:135-145, 1988 link. Geoffroy, M., et al. Reduction of Desensitization of a Glutamate Ionotropic Receptor by Antagonists. Molecular Pharmacology, 39:587-591, 1991 link. Fu, X. et al. Antitacyphylactic Effects of Progesterone and Oxytocin on Term Human Myometrial Contractile Activity In Vitro. Obstetrics & Gynecology 82: 532-8, 1993 link. Jones, M.V. and Westbrook, G.L. The impact of receptor desensitization on fast synaptic transmission. Trends in Neurosciences. 19, 96-112, 1996 link. Sakmann, B. Elementary Steps in Synaptic Transmission Revealed by Currents through Single Ion Channels. Neuron 8, 613-629, 1992 link. Lohse, M.J., et al. Multiple Pathways of Rapid b2-Adrenergic Receptor Desensitization. J. Biol. Chem. 265: 3202-3209, 1990 link.